The holiday market gets even more jam-packed this weekend with five new wide releases. - Martin Scorsese's and Leonardo DiCaprio's streak of success over four films dating back to 2002. - Strong early reviews and considerable awards buzz. - Positive online tracking metrics across Twitter and Flixster. - The controversial content could alienate some middle America audiences. - The running time will limit the number of showtimes theaters are able to give. - The crowded holiday market and competition from American Hustle, going after a similar crowd. 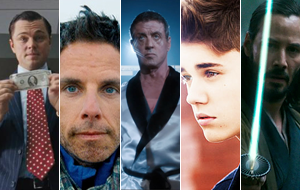 - Ben Stiller's past box office success, particularly around the holidays. - A strong marketing campaign that raised considerable awareness. - The holiday-friendly themes of a feel-good story. - Stiller's directorial stature hasn't been tested in this large of a way before, stepping out of his usual straight-up comedic genre. - The crowded holiday market and competition from other family-friendly films. - Online activity has been modest, indicating the film may mostly appeal to older crowds. - The promise of seeing Raging Bull and Rocky together could be enticing for audiences. - Older crowds looking for a genuine comedy will have nowhere else to turn this holiday season. - Online activity has been tepid, although that may simply underline the film's older appeal. - The crowded holiday market. - Universal has mounted a strong marketing campaign with frequent ad placements over the last few weeks. - Keanu Reeves returns to the stylized action genre where he found his biggest success in The Matrix films. - Modestly positive Flixster buzz. - Reeves hasn't been much of a box office draw in years. - The crowded holiday market and competition from The Hobbit: The Desolation of Smaug. - Sluggish Twitter and Facebook activity. - Bieber sent his first film, Never Say Never, to a strong $73 million domestic run in 2011. - Pre-sales are expectedly strong from his fans. - Bieber's image has taken more and more hits as he's grown up, especially over the past year. - Online buzz is significantly behind that of Bieber's past standards, and even that of One Direction: This Is Us. Check out our forecast for these and the remainder of the weekend's top 13 in the table below. A website is much powerful than you could ever imagine. Strategic website design by improving user experience can improve your online sell & conversion. It's can make you successful in business. Thanks!